Acids and bases do not require much math at the organic chemistry level. 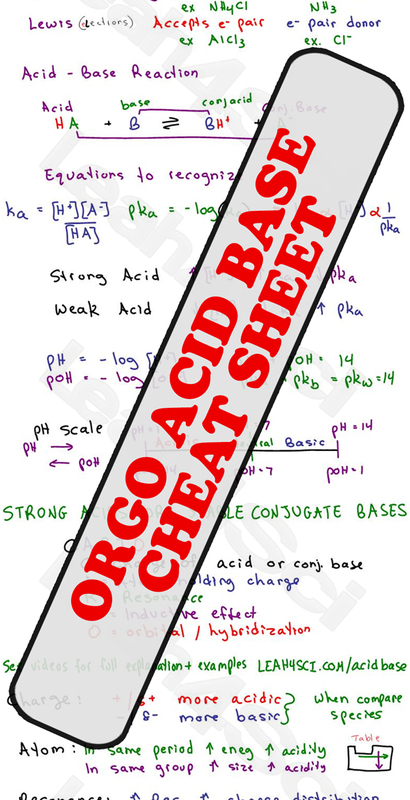 Instead you will be required to understand what makes a strong acid or weak conjugate base. Your goal is to understand the nature of acidity and basicity so that you can comfortably rank the strong and weak molecules based on structure and conjugates. Your professor may rush through it, and your textbook skimp on details, but you must put in the effort to really understand this topic. To help you along I’ve created a detailed Acid/Base video series. But for that extra bit of help, I’ve put together a detailed study guide cheat sheet. NOT to memorize, but to serve as a guide while you study and work through homework problems. I love your tips and simplified sheets. Could you make one on what makes a good nucleophile and leaving group? Have you seen my video on this Amanda? I loved all your worksheets. It made my teaching easier and saved me time preparing my lessons. Thanks. That’s really exciting to hear Lou. Where do you teach and at what level?